The Waller family have maintained a traditional mixed grazed upland farm while most other farms in the area have specialised in sheep or dairy. The farm business works to the strengths of the mixed farm approach. The Wallers have diversified into a highly successful tourist enterprise. 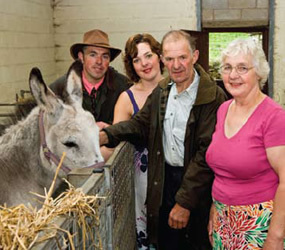 Blaze Farm has been listed in the Sunday Times as one of the UK’s top 50 attractions in the UK. Visitors are drawn to the farm by a network of nature trails that pass through ancient woodland, newly planted upland cloughs, old hay meadows and wildlife ponds. Most trails are easy access but the most challenging trail rewards the intrepid with views from 1,200 feet of the breath taking geological feature – Hield Rocks. Milk from the farm’s dairy herd is used to produce Hillbilly icecream, however there is nothing of a rough hillbilly nature in the way the farm is managed. The dairy herd is crossed with dairy shorthorns to produce a lighter animal less prone to poaching pasture and with a good confirmation for beef production to offset the reduction of milk yield per cow from the cross bred animals. The free access policy of the farm ensures thousands of people learn about this and other innovations that integrate the environmental, access and farm production objectives of Blaze Farm.